Helping your children understand why their grandparent is struggling with Alzheimer’s can be tough. There are times when they might feel confused or even frightened by this new phase in the family, but finding ways to make sure that your kids and your loved one spend quality time together is important, and games could be an excellent way to accomplish this and help everyone feel more connected. Word-recognition games are excellent because they can help jog your parent’s memory and improve his or her cognitive skills. At the same time, it can also help your child boost their vocabulary and spelling. Talk about a win-win for the whole family. It also requires just a pen and paper, and can be played almost anywhere. Because one of the first signs of dementia-related illness is the inability to recognize certain words or phrases, having your parent spell them out could help them deal with this symptom more effectively. This could be an excellent way for both your parent and child to relax and spend some time outside. We all know that children need to get outdoors and play for their health, and some sunshine and fresh air is also excellent for your parent. For example, your dad could join the younger kids for a fun afternoon of bocce ball, bowling or mini-golf. If he’s spending time with older kids, they may all enjoy a round of golf on the “big boy” course or the children can swing a racket with their grandpa at the local tennis court. Dementia patients benefit greatly from staying active and enjoying sports they once loved, so this is an excellent idea for mental and physical health. Observational skills are a crucial aspect of child development and can also help your dad if he struggles with dementia, and these skill sets are one of the building blocks of this fun, treasure hunt-themed activity. This doesn’t have to be too complicated, either. You can simply make a list of items that are found in the backyard, such as a feather, a certain type of leaf or garden tool. If you want, you can even include rhymes so that both your dad and child can add some poetry into the mix. Not only does this help them understand their environment more perceptively, but it can also allow them to bond together as a team. 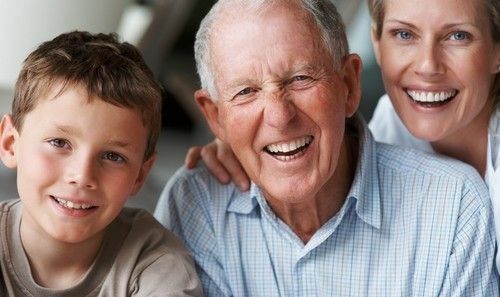 Some of the most memorable pastimes that kids have with their grandparents is playing card games, and the best thing about them is that they often require simple math principals like addition, subtraction, multiplication and division. This is obviously an excellent activity for your child as she learns these techniques in school. Skills such as these are also very beneficial for your dad as he struggles with dementia, because math skills are important in keeping up and tracking budget – which is one of the things that many seniors are faced with with when they are diagnosed with Alzheimer’s. Since kids are unbelievably tech-savvy these days, video games are an excellent way for your little ones to teach their grandparents. While there are some that might not be suitable for your dad, there are others that encourage physical activity – such as Wii Fit – and several games that specifically focus on interaction and memory skills. Violent video games often get a bad reputation in the media as not promoting intellect, but they don’t always have to encourage bad behavior. And there’s science to back this up: According to an American Psychological Association study conducted in 2013, video games can actually provide learning, health and social benefits. Let your little ones go through some of their grandpa’s old clothes and play dress-up. Dementia patients tend to forget things in the short-term, but will often remember events that might have happened decades ago. As your children play dress-up, your father can tell them stories about when he grew up and the adventures that he had. This will fascinate your kids and help your senior parent get a better handle on long-term memory skills. Kids and games are often synonymous with one another. To promote a more active learning environment with your little ones that involves your parent with dementia, try some of these activities to see if they are mutually beneficial for them both.